>> Compared to the 2010 poll results the top 5 almost contain of the same songs. 5 years ago 1930 made it to the top (now No. 4) and The '59 Sound jumped this year to No. 1 (having been No. 3 in 2010). >> The highest entry from the 2 new albums is the song Handwritten, ranking at No. 6. 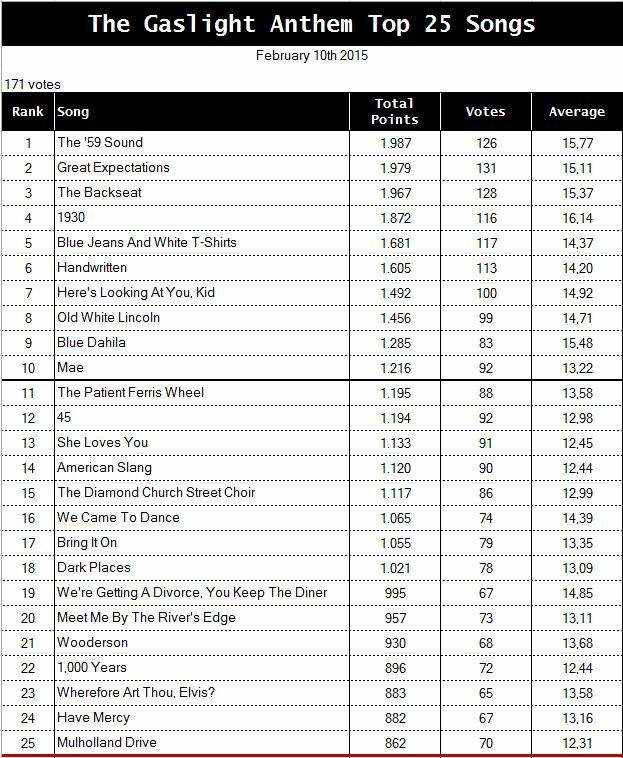 >> The highest ranked song from American Slang is the bonus track She Loves You, beating American Slang by one place. >> Apart from Sliver, 1930 has the highest average vote with 16,14 points. So are the results how you expected them to be? Does the comparison to the 2010 poll reflect how your favourites changed over the years? I am glad to see I am not the only one who hates the cover of Sliver. Well, not the cover, the song in general! This is pretty cool! I agree with most of the results except for a few. I think Drive should be higher up as well as Mama's Boy but overall, agree wholeheartedly! Thank you! Red in the Morning was really the lowest? Man, I love that song. Misery was way lower than I thought it'd be. Re: covers. Some things shouldn't be covered. Ever. By anyone. (But I'll stop there and will not comment on which ones I think are sacrilege cuz who cares what I think anyhow... ). All of SoS is super underranked. Presumably the fans of the newer stuff have obviously stuck around while a lot of the people who like the older stuff just don't come around here anymore. Lovely! 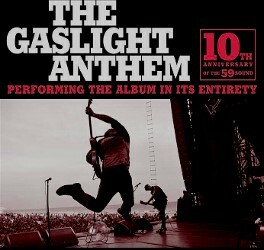 What I wouldn't give for a Gaslight show with these 25 songs... Thanks for organising this, very interesting! Let's hope they try to play some of these songs a bit more often. I haven't heard Here's Looking At You, Kid in ages, and it's my favourite Gaslight song! Ehh it's interesting to me how high a lot of these songs made it on the list... The Patient Ferris Wheel, 45, Mae, Dark Places, Wooderson... can't really say i'm surprised though, this does seem like an accurate representation of which songs people seem to like most. I'm very biased, but how Bring It On isn't in the top 10 is beyond me. As Gaslight changes more and more over time I think it's becoming harder to objectively compare and rank these songs, especially when thinking about Get Hurt and Sink or Swim. I also think this list would be a lot different if the Horrible Crowes songs were included. But I'm glad Mulholland Drive, Meet Me By the River's Edge, and some of my favorite AS songs got in there, and that Blue Dahlia made it so high on the list! Come see about me muthafucka! Still to be fair, it did get dead last the last time this survey was taken. Can't say a lot surprises me about this list. Although I would've thought Red In The Morning would've gained A LITTLE ground by now. It certainly has moved up a few notches in my book. I mean, Desire beat it? I am SOOOO pleased to see that the album version of Boxer was ranked THAT much higher than the itunes version. I was worried I was the only one who felt that way! I'm mostly happy about this though. 12 of my top 25 are on this top 25! Hahaha, I was just thinking "Great! Now I DON'T want to see a show with even half of that top 25." Some of my favorites (and clearly some of the fanbases favorites) are just too overplayed. The way you said you feel about '59 Sound is how I feel about Great Expectations (and Here's Lookin' at You Kid). If I don't hear either song live for 5 years it'll be too soon. And it's a shame because I do really like GE. I'm just. so. sick of it. Thanks for doing this admins! And for that little fun fact list Manuela. I think it's pretty interesting that the highest-ranking track from AS, the second-highest from Handwritten, and the third-highest from Get Hurt are all bonus tracks, not even on the standard album. Maybe they ought to start including their bonus tracks! Oh same here! I ranked 59 sound as like #2 or 3 on my list for that reason. But if I had the choice between hearing '59 Sound for the 30th time and hearing We Did It When We Were Young (which didn't come close to making my top 25) I'd rather WDIWWWY because I've never heard it live before. I think I see what you mean more so with other artists I love. Like if Bruce ever didn't play Born to Run at a show, I'd be devastated! But for me there's so little distance between my favorite and least favorite Gaslight songs (barring maybe three that absolutely dislike) that it's more about how rarely I get to experience that song in a live setting, than where it ranks compared to the others. Think my biggest surprise was how low Boxer finished and how high Dark Places finished. Great to see Blue Dahlia finishing so high. Love that song. Can anyone point me in the direction of the list from 5 years ago? Be good to see that. Conclusion: they should play a show where they play ALL of their songs! I'll make sure to clear my schedule. Haha, YES! Every show. According to iTunes that will only take 4 hours and 39 minutes as long as they exclusively stick to the studio albums and their bonus tracks. They could handle that, right? Just make sure to make some time for Brians banter, so about 5 hours straight should do the trick!